beard oil review // The Bluebeards Revenge. The first thing I noticed about Bluebeards products is the skull and cross bones, which I bloody love. I'm a mans man and naturally I'm drawn to anything like this. It's a simple brand and it's good to see how many times they call it a 'manly' beard oil. I want a product to make me feel manly? Don't you? I want a product that oozes ruggedness and makes me want to lather myself in beard oil, drink rum and talk like a pirate all night with my mate until I lose my voice (true story). My preferred choice of the beard oils was the Cuban Blend. * The cedar wood scent is a very pleasing smell to have resting just under my nose. Apply a few drops into your fingers and massage into your beard, look into your mirror and you can now almost see Jack Sparrow looking back at you. If you want something without as much scent, the Classic Blend is the one to go for. It feels just as nice on the beard and will still soften up your sea salted Davey Jones face rug in no time. I'm gonna have to wait another month or so before I can properly test out the moustache wax (still growing) but again, it smells great and feels pretty solid like it'll give a good hold! Anyone got any tips on how to soften up and apply moustache wax? 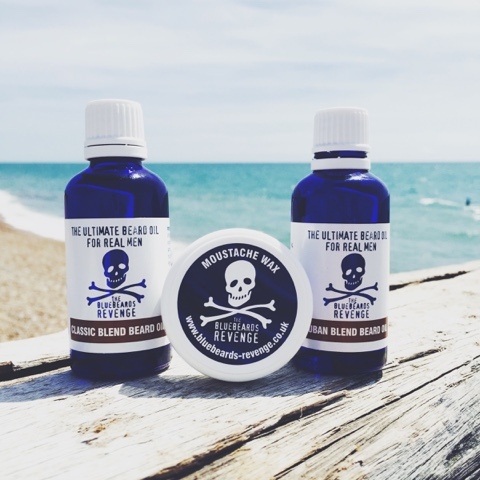 The Bluebeards Revenge have also bagged themselves the title of Brand of the Year at the FHM Grooming Awards 2014, which I say is well deserved. Although, they had better hold on to it...Pirates steal things after all. A well branded, 'manly' product that I'll be using from now on. The price of the beard oils won't cost you many of your hard earned golden nuggets either. £9.99 for a 50ml bottle.